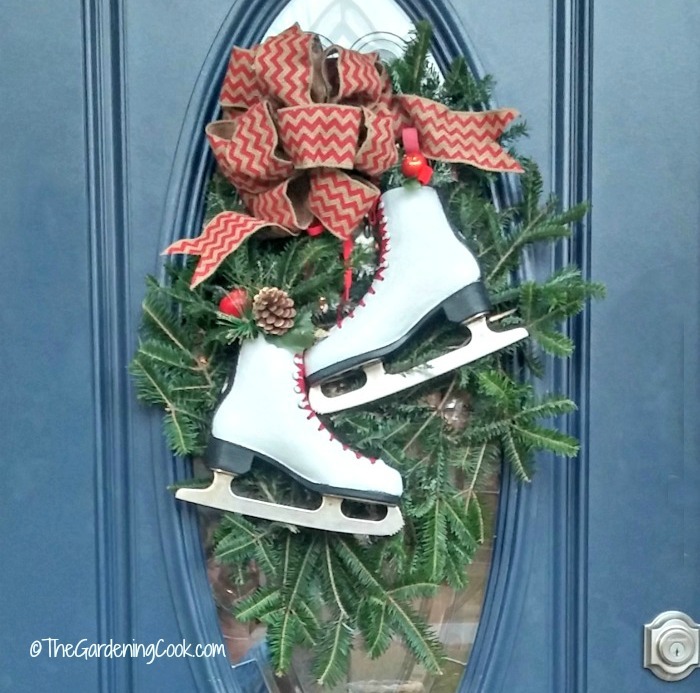 A Christmas wreath is a popular way to decorate your entry for the holiday season. 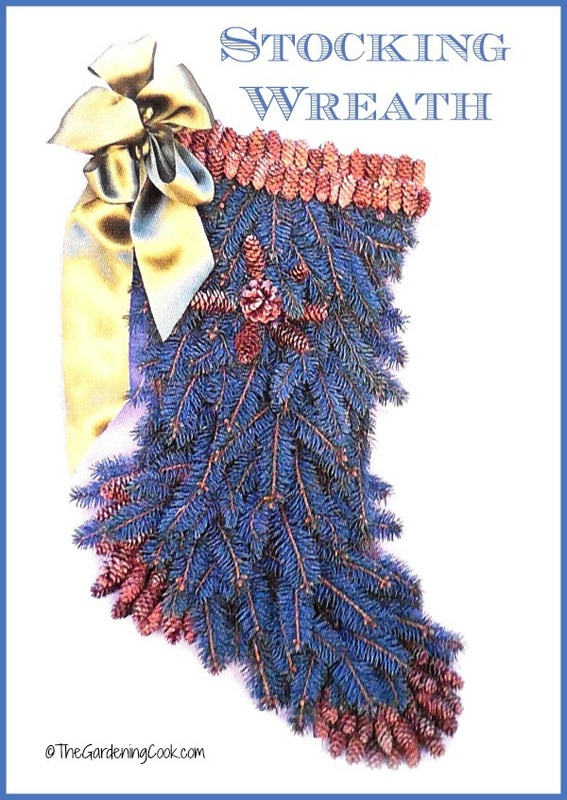 Christmas Wreaths are also used on mantles and in other areas of the home and garden such as garden gates. 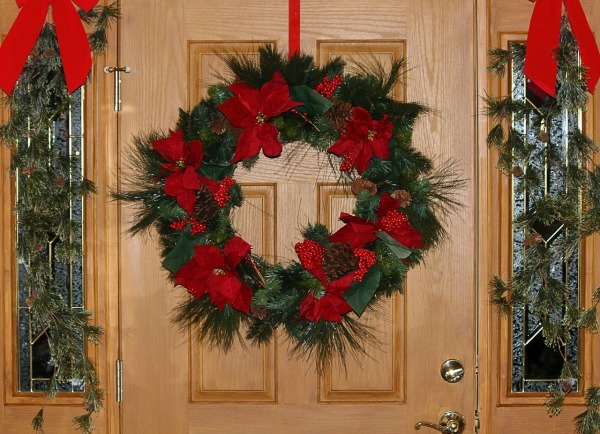 Nothing quite sets the mood for your party guests like a front door decorated with a Christmas Wreath. Decorate Your Entry with one of these Christmas Wreaths. We all love the look of the traditional round shape of Christmas Wreaths on the front door, decorated with pine cones, and poinsettia leaves. 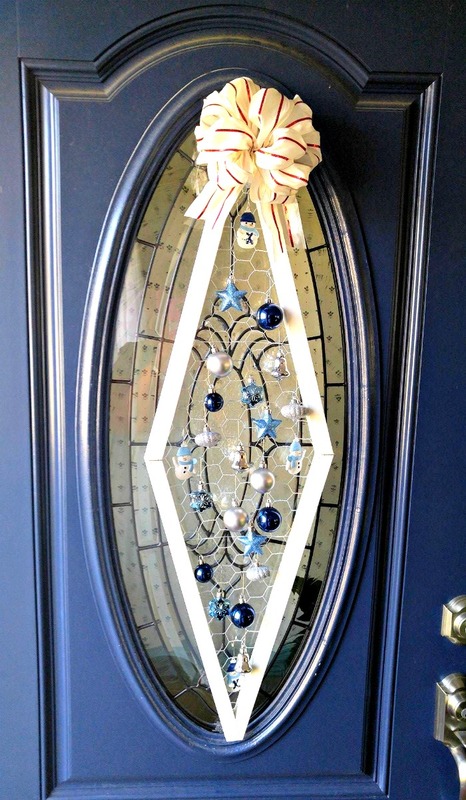 But door wreaths do not have to be just the traditional round shape either. There are all sorts of shapes as you can see from the images below. The basic wreath is made the same way, with wire in a shape which holds branches from evergreen trees and bushes. Once formed, it can be decorated as you wish. 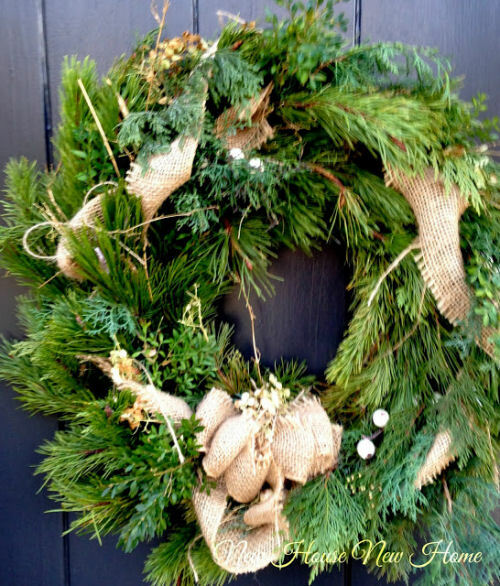 This lovely design features both pine, cedar, and spruce clippings with a large, rustic burlap bow added. Heather from New House, New Home, New Life also added dried hydrangeas, and her favorite weeping cypress as an anchor. Everything comes together beautifully. This traditional pine bough Christmas wreath uses festive holiday sprigs in a red and green theme so often used at Christmas time. I love the way the side windows also have the boughs to add accents on both side. Source: Public Domain photo at Pixabay. Here is another design that strays from the traditional round shape. In this wreath, the wire is bent into a tree shape and decorated with apples. This would be a nice one to have outside for the birds too! 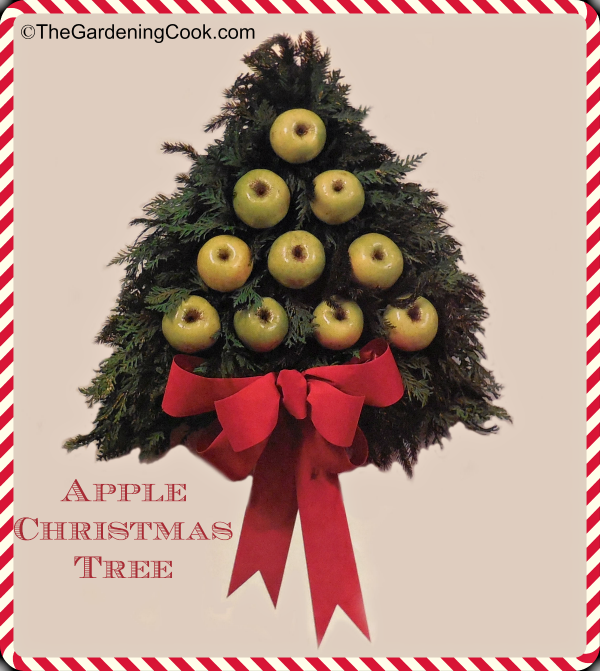 See how to make the apple Christmas tree wreath here. The inspiration for this boxwood wreath came from the two bushes outside my front door. My husband loves the bushes (he is English and had them at his home there), so it makes a great way to welcome him home each night. See how to make this boxwood wreath here. This is another unusually shaped wreath that the birds will love. It would look great on the side of the house or even a garden shed. 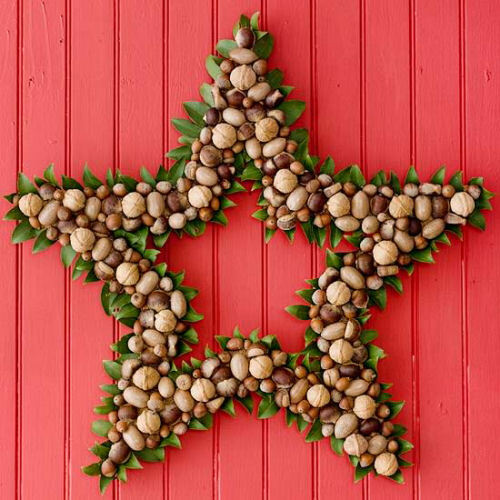 For this project a star shaped wreath form is covered with ribbon and then has mixed nuts hot glued in at random. The fresh bay leaves on the outside finishes the project perfectly. Shared from Better Homes and Gardens. Oh my goodness! This is one of the cutest wreaths I have ever seen. 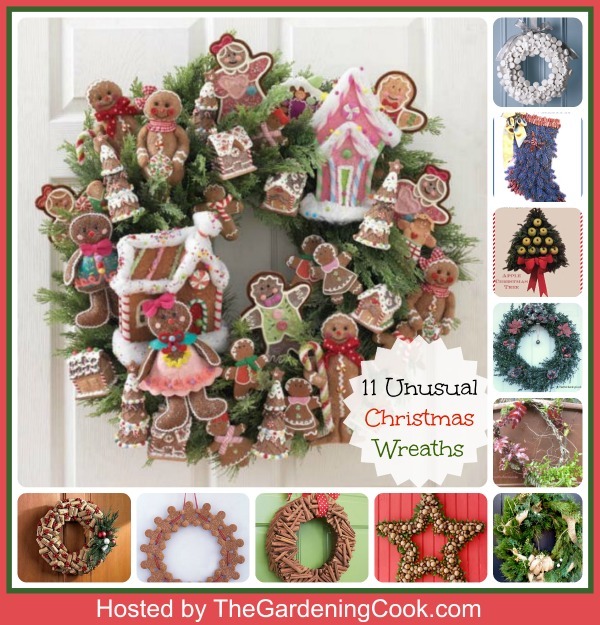 The basic round wreath is decorated with all manner of gingerbread pieces from cookies to trees to houses. See the tutorial at Raz Christmas. 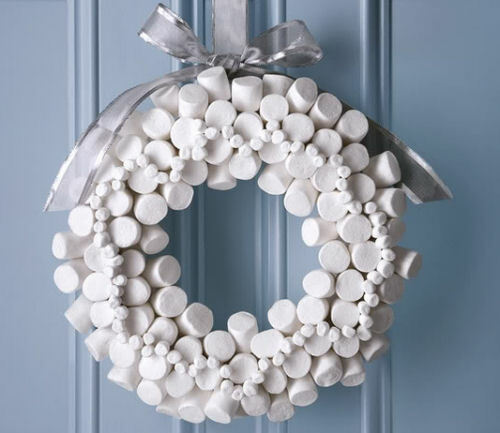 What a great idea this marshmallow Christmas wreath would be to hang outside! The birds will love it. To make it just insert toothpicks into a white foam wreath ring and add both large and small marshmallows to it. Add a white wire trimmed bow and you have a love, white wreath. Idea shared from The Food Network. 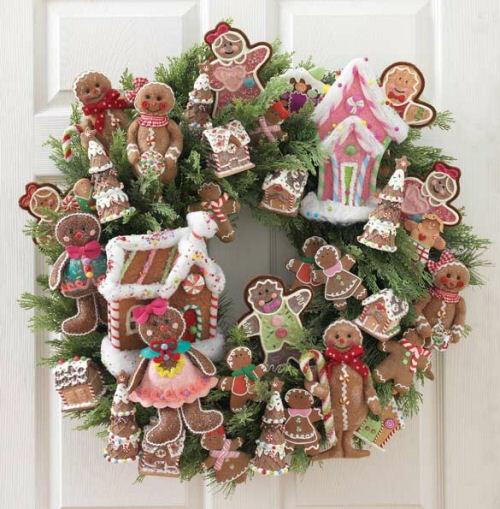 This unique Christmas wreath made of gingerbread men would make a great entry to your home, at least until guest start nibbling on the goodies that made it. 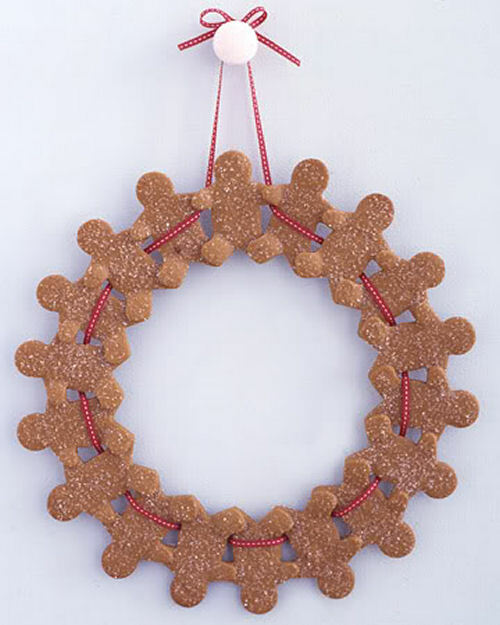 See the tutorial for this Christmas gingerbread wreath at Martha Stewart. 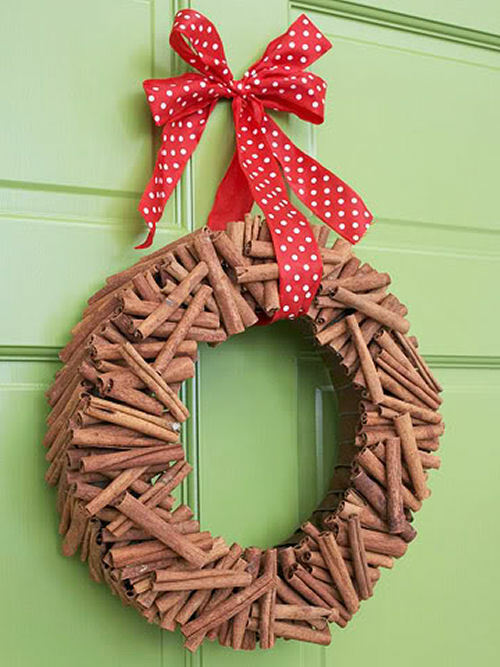 Imagine how beautifully your entry would smell with this cinnamon stick wreath? The wreath is made by wrapping a foam base in ribbon and then covering it with cinnamon sticks and pieces. Add a bit looped bow to hang and you have an unusual and delightful Christmas wreath. Idea shared from Better Homes and Gardens. Got wine corks to spare? 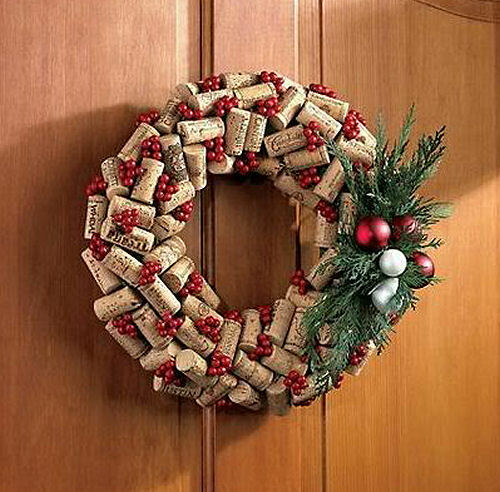 How about making a wine cork Christmas wreath similar to this lovely project? This one is a retail version from Wine Enthusiast but it would be easy to duplicate. It would take 70 wine corks hot glued at random to a wreath base (a grape vine wreath would work) and then finished with holly berries and a sprig of cedar leaves with some ornaments attached. 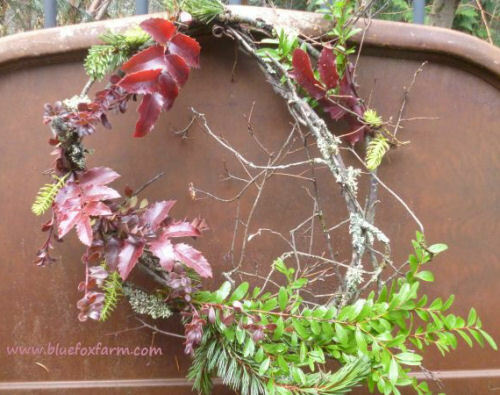 This wreath is certainly not traditional in any way but the story behind it is what I love. Jacki from Blue Fox Farm collected everything for the wreath on one of her morning walks. Each time she looks at it, it will remind her of that walk. And the beauty of it is that she can add to it on future walks….almost like a collage! These ice skates from my local ice skating rink were going to be thrown away last year. I grabbed them and turned them into a great looking swag wreath for my front door. It has an oval glass panel that made decorating with a round wreath a challenge. See the tutorial here. This is this year’s door decoration for our front door. Inexpensive Christmas ornaments, chicken wire and some reclaimed wood from our kitchen make over got put to great use for this decoration. See the tutorial here. 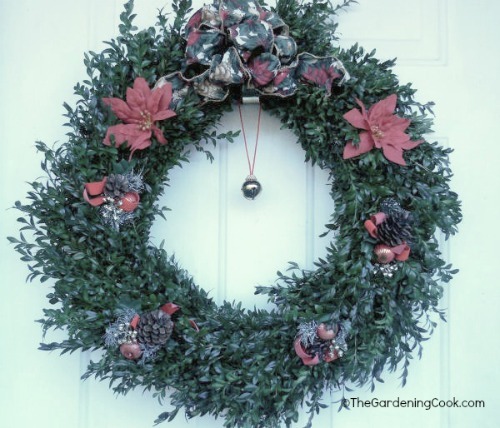 What have you done for Christmas Wreaths that is different from the normal green decorated wreath? Please share your thoughts in the comments below. These are all wonderful ideas! I really like the marshmallow wreath, it reminds me of the song ‘It’s a Marshmallow World’…perfect for Christmas. I have to pin! Thanks for featuring all these. My pleasure Debbie. I love that marshmallow one too! I’ll have to see what I can do for that. I learned to make bows years ago at a Christmas store that used to be open here and they had a designer teaching bow making and I’ve never forgotten it. It’s really not that hard. Wired ribbon is the key!